“Underneath the comic façade I saw a real person of flesh and blood with serious beliefs. I never intend to be a satirist. I never intend to play for laughs.” This is how Margaret Rutherford inadvertently defined comic acting and it’s analysis that stands the test of time. It’s the basic comic principle the late great Roger Ebert cited again and again: “People trying to be funny are never as funny as people trying to be serious and failing.” In this new improvisational Apatow-influenced comedy ecosphere, however, people are almost always trying to be funny. In a New Yorker profile of Steve Carell, Tad Friend wrote that when “an improv really works, it has a skewed specificity that bears the stamp of an actor’s subconscious.” And that’s often what we are subjected to on screen anymore in comedies – the actor’s subconscious. Carell makes slight variations role to role but his innate nature always rises to the top. Heck, even in “Foxcatcher”, where he piled on the tics and changed his voice to approximate John DuPont, if you look real, real close all you really see is Michael Scott. The comedy subconscious hit barrel’s bottom in “Wanderlust” when Paul Rudd was allowed to stand in front of a mirror for what seemed like a half-eternity and make faces. It wasn’t comic acting so much as riffing, a bit for Funny or Die that just happened to be projected onto a movie screen. That, I think, is why Matt Damon is undersold as a valuable comic acting commodity. Consider this piece of PopSugar clickbait (which you shouldn’t actually click on). It cites “14 Times In Which Matt Damon Proved He’s Absolutely Hilarious.” Alas, only one of those times, his glorified cameo in “Eurotrip”, is from a motion picture. The rest involve Internet videos and talk show appearances and such. It’s not that he’s not funny in these moments; it’s that it grossly undersells his substantial ability as a comic actor. This came to mind a few weeks ago when Steven Hyden wrote a piece at Grantland exploring, as he called it, “The Four Versions of Matt Damon.” The versions: Everyman Leading Man, Reluctant Action Star, Team Player and Jerk. None of these Damon descriptors are wrong yet they conspicuously leave out his genuine abilities as a comedian. To be fair, Hyden does highlight Damon’s funny-man performances, he just sees them through a different prism. 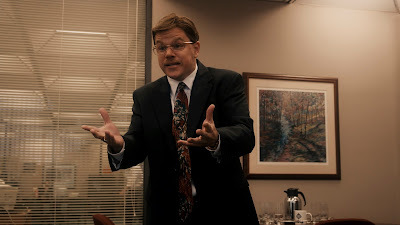 He sees Damon’s turn in “The Departed” as a “sniveling little liar” and his role in “The Informant!” as a “middle-American doofus.” The labels are apt, and perhaps this is why Mr. Damon never gets full credit for being such a funny guy – his funny guy parts are always wrapped up in another persona. In “The Departed” he might very much be the “sniveling little liar” Hyden pegs him as, but Damon also outfits his Colin Sullivan, a Boston cop turned mob informant, a distinct petulant comicality. “They have this,” he says at dinner with the air… “and they don’t have duck l’orange.” He’s an asshat and Damon knows it and plays straight to it. In “The Informant!” he’s essentially playing a straight-faced version of Tommy Flanagan: The Pathological Liar. But whereas Jon Lovitz played the role like the sketch it was, fishing for laughs, Damon just takes the dude at face value; a compulsive liar who seems ill-equipped to confront that compulsion. In a way, these characters, living grand fabrications, are similar, but Damon plays both men completely different, getting under their skin to find what makes them tick, and allowing the humor to rise intrinsically from the person he’s playing. 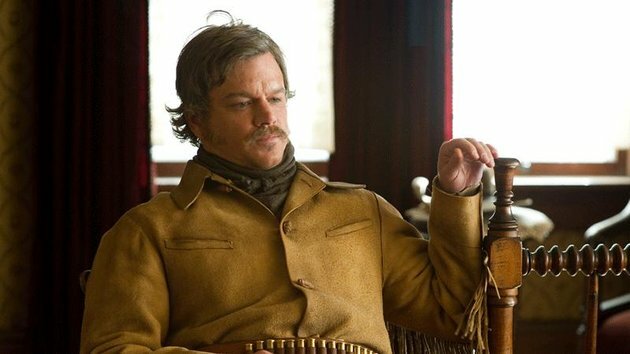 In “True Grit”, Damon took it to the next level. In an interview with Geoff Boucher of the Los Angeles Times “Damon said he and Joel Coen came to the idea of making the cowboy a sort of Cliff Clavin of the Old West by modeling him on Texas actor Tommy Lee Jones but subtracting the notable fact that Jones is a Harvard-educated intellect.” That sounds like an impossible-to-meet standard, yet Damon manages the feat, affecting an Old West spin on George W. Bush and any untold number of Don’t Mess With Texans, citing his home state like it renders him impervious to criticism. But he is also a moral authoritarian, fancying himself an arbiter of, well, everything, and when he spanks the film’s other protagonist, the young girl, Damon looks like a put upon schoolmaster. It’s a great moment, of which Damon has many, but it’s also telling of the full arc he effects, one that goes from Texas Ranger to Big Baby. Never, however, has Damon been more comically skilled than in his turn as Linus Caldwell in “Ocean’s Twelve”, the much maligned sequel to “Ocean’s Eleven.” The performance is all about, as Hyden noted, being stuck in “little brother lane” to George Clooney and Brad Pitt. Those two titans were very funny in their own right but were also playing variations of themselves, reveling in their Hollywood wattage, while Damon got under the skin of his character. The name “Linus” is no accident. There might be a live-action “Peanuts” movie on the way but Damon turns Linus Caldwell into a heist movie Linus Van Pelt, believing in the Lost in Translation like The Great Pumpkin. He wants to prove he’s a leader, that he can hang with the Big Thieves, and he spends the whole movie trying to worm his way from supporting to top billing, eager beaver-style, never quite getting promoted from JV to Varsity. And underneath that marvelous comic façade you see a real person of flesh and blood. Damon is not being a satirist and he is not playing for laughs; he just is. And goddam, is he ever funny. Bless you for your final paragraph. I dug this whole post, but your praise for Damon's work in Ocean's Twelve is something I'm totally on board with. I love him in that film..."little brother lane"... I hadn't heard that before. So true. (scoffs) "Ughhhhh, you told dad?!"